Have you ever been lost, wandering a ten-story parking garage with absolutely no recollection of where you parked? Isn’t it frustrating when you end up circling around for 30 minutes only to find parking on some nondescript side street 10 miles from your destination? Even if you are equipped to handle this kind of situation with a car alarm—acting as a sound locater if you are within a suitable distance—that only helps about 30% of the time. When & Where, with the heading “Park in Peace,” is a lifesaver, especially for people like me who have no sense of direction and always seem to forget where we parked. When & Where is complete with a meter timer that acts as an alarm clock, notifying you 10 and 5 minutes before your meter is going to run out. Once you park and feed the meter you simply set the timer and go. Along with the timer, there are five other options to guarantee that you will find your way back to the car. There is a camera for you to take a picture of where you parked, a voice recorder if you want to give yourself in-depth directions back to the parking spot, an area to write notes, a parking space category with level, row, and space number drop down options and a GPS map that gives you your exact location-in case the street sign is missing or to give you the cross streets. For $0.99 you have the option to avoid getting a parking ticket or needing a search and rescue team to find your car. Even if you don’t want to put forth the effort to record your voice, input your parking spot number, or set your meter timer, at the very least you can pull up the map and get a feel for where you are. The only thing problematic about this app is that if you are the type of person who is forgetful enough to loose your car, it is highly unlikely that you will remember to pull up this app and type in notes, set a timer, or record your voice, every time you have parked. 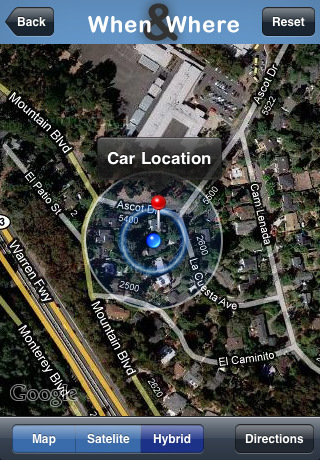 AppSafari review of When & Where was written by Vanessa Paszterko on June 18th, 2010 and categorized under App Store, Auto, GPS, iPad apps, Maps, Search, Universal, Utilities. Page viewed 5601 times, 1 so far today. Need help on using these apps? Please read the Help Page.